A call has been made for the only surviving document issued by William Wallace to be returned to Scotland. The Lubeck Letter was sent by Wallace and Andrew Murray in 1297 to the mayors of Lubeck and Hamburg. It was written following victory at the Battle of Stirling Bridge and informed German merchants that Scots ports were no longer under English control. A parliamentary motion asking that it be released from Lubeck's National Archives has been lodged. The motion was lodged by Mid Scotland and Fife MSP Murdo Fraser who believes it is one of the most significant documents in the country's history. The Conservative politician said: "The letter is a link to a pivotal point in Scotland's history and gives an insight into William Wallace as the statesman and politician. "William Wallace is rightly remembered as a hero to Scots for his great victories on the battlefield but this letter reveals another side to him which is not always mentioned in the history books." The letter has previously been lent to the Scottish Parliament for an exhibition and Mr Fraser wants ministers to begin a dialogue with the City of Lubeck's National Archives about having it on "permanent loan". Mr Fraser said: "I understand that Scotland has no claim for ownership of the item but I hope that goodwill and co-operation could result in the letter returning to Scotland. "I would welcome the day when Scots are able to see the Lubeck Letter and the emblem of William Wallace in their country and this would be a gift for which Scotland would be forever indebted to the City of Lubeck." 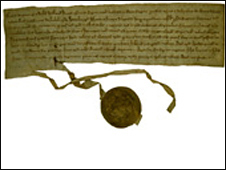 If the document, which is thought to carry the only known impression of Wallace's own seal, is returned to Scotland, Mr Fraser would like to see it stored in the Wallace Monument, near Stirling.